Watching Buster Posey in the World Series, I cannot help but recall the old days when catchers would just flip around their batting helmet before putting on their catcher’s mask and that would be all the protection they needed behind the plate. That has become something of a classic look nowadays as so many catchers, like Posey, have gone to the” hockey style” catcher’s mask, a mask which looks like it was developed not in the musty office of an aging Rawlings sales rep but in a aero-dynamics lab on an American university campus somewhere. For the old school baseball fan, like myself, who grew up watching austere receivers like Johnny Bench or Bill Freehan the new mask is an eyesore and just another useless accessory, like the ankle guard or personalized wrist band, that threatens the visual simplicity of the game. And then there are the special oversized helmets for players who have suffered a head injury or concussion, like David Wright, or Francisco Cervelli. 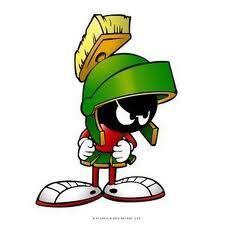 Every time I see Cervelli in that ridiculously oversized helmet I cannot help but think of Marvin the Martian from the old Bugs Bunny cartoons. I wonder how would Freddie Patek, all 5’4″ of him would have looked in one of those ? This proliferation of specialized helmets is, I suspect, a reflection of our over-protective society and baseball’s propensity in recent years to fashion a new look for itself in an effort to attract younger fans. Fortunately, I have not met anyone who likes this trend.